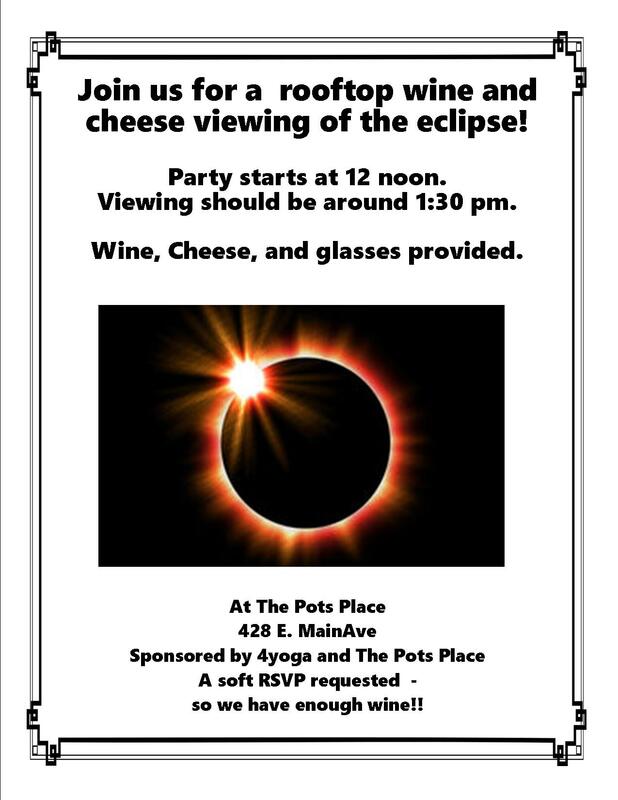 If you are looking for a place to view totality, please join us on the deck off the lounge at The Pots Place on Mon., August 21! Kathie is generously providing wine, cheese, and viewers; you are welcome to bring a dish or beverage to share or just to bring yourself. We will begin gathering at noon, and totality will begin at 1:27:23. To make sure we have enough supplies, please RSVP by completing this Google Form or sign up on the sheet at the studio. We look forward to experiencing the eclipse with you! For more information about this eclipse and what to expect, see the Great American Eclipse site. This entry was posted in community, party, schedule and tagged August, Great American Eclipse. Bookmark the permalink.